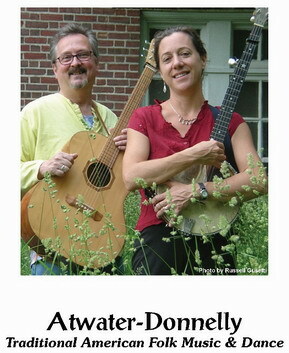 We’re pleased to welcome Atwater-Donnelly to Wesley on September 19 to perform a concert at 7:30 p.m. The highly acclaimed husband-wife duo, Aubrey Atwater and Elwood Donnelly, present delightful programs of traditional American and Celtic folk songs, a capella pieces, old-time gospel songs, dance tunes, and original works. Elwood and Aubrey blend gorgeous and unusual harmonies and play guitar, Appalachian mountain dulcimer, mandolin, tin whistle, harmonica, banjo, bones, spoons, limberjacks, and other surprises including Appalachian clog dancing, French Canadian footwork, and Tap. Aubrey and Elwood met as volunteers at the Stone Soup Coffeehouse in Providence in early 1987. Within just a few months these self-taught musicians from Rhode Island formed a duo. Married since 1989, Aubrey and Elwood perform throughout the United States and, on occasion, abroad. Their ten recordings receive international airplay. Highlights include airplay on National Public Radio’s “All Things Considered,” Fiona Ritchie’s “Thistle and Shamrock,” and the nationally syndicated “Midnight Special” out of Chicago. Tickets are $12 and all proceeds will go to support our world missions. All are welcome!